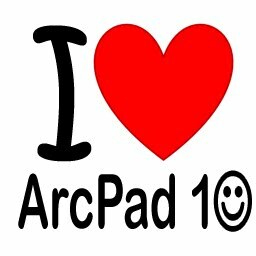 The ArcPad Team Blog: ArcPad10 Now Available! Download ArcPad 10 and try it in 20-minute intervals at no cost. The ArcGIS Server ArcPad extension is not included with the evaluation version of ArcPad 10. Download and read the installation guide for system requirements, licensing information, and more. Request the ESRI StreetMap Data Unlock Code. I've been an ArcPad user and developer since 2006. I have been using ArcPad 7.0.1 for all this time and thought it might be time to upgrade. So, I just spent part of my weekend putting ArcPad 10 through its paces on one of my Trimble Recons. To get an idea of how it has changed, I performed the same operations on the same map on an identical Recon running ArcPad 7.0.1. My first surprise was that each version had very similar performance on a large map with a fairly large raster base. It took ArcPad 10 and ArcPad 7.0.1 about four seconds to render the same raster file in Mr Sid format when zoomed or panned. I also tested a large points shapefile and again ArcPad 10 was no faster than ArcPad 7.0.1. As far as I can tell, ArcPad 10 does not offer any advances in speed. The new look has sharper icons but the menus and toolbars still take up exactly the same amount of screen real estate which could be better used on the map itself. I hid the taskbar and all but one menu on ArcPad10. This gave me exactly the same amount of map space as I have in ArcPad 7.0.1 with my stacked menus and expanded screen provided by a DLL from ArcScripts. So, ArcPad still uses far too much room for menus as far as I am concerned. The lock and menu arrow icons on ArcPad 10 are so small and close together that it is way to easy to hit the wrong one or even miss both of them. Sometimes it took four or five tries to activate the lock or the menu arrow. I fully expected to buy ArcPad 10 on Friday. Now, after trying it, I've changed my mind. Given the cost of ArcPad 10 at $700 I really can't justify the expense. The old versions work just as well and sold for significantly less. I invite ESRI's ArcPad developers to spend some time in the field to discover just what we users value in their product and how to make it better.